Mayan Moon Goddess ---Recently, in the steaming Guatemalan jungle, a magnificent limestone carving from the 600-900 AD period was discovered. Archeologists believe it to have been the back of a royal throne. This throne back depicts three figures. One is a female sitting cross-legged and reaching out to touch a mythical animal- like creature. The third is an authoritative looking male. The man and woman wear elaborate headdresses of feathers interwoven with their hair. 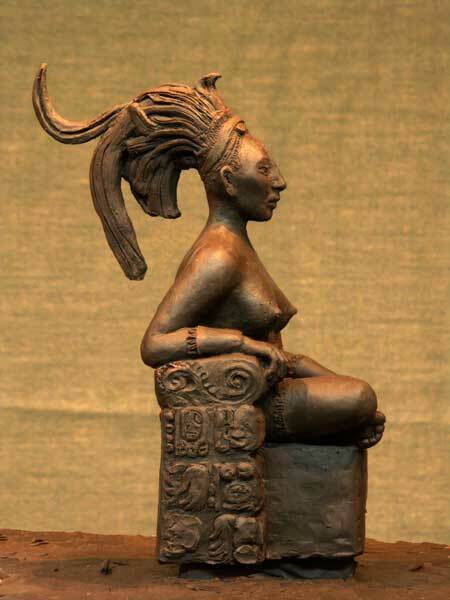 The Moon Goddess represented fertility in the Mayan Culture.